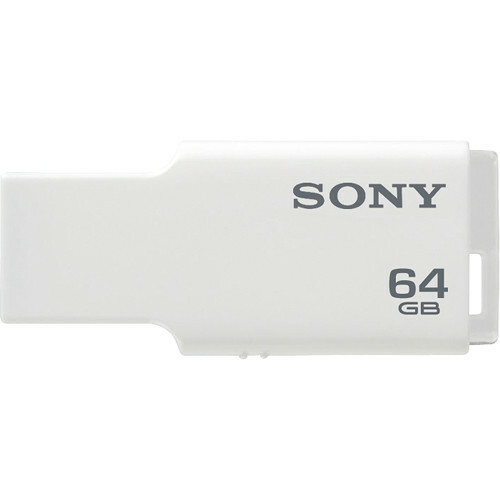 The Sony 64GB Micro Vault USM-M USB Flash Drive (White) is a highly slim and compact USB 2.0 flash drive. Its small form factor is ideal for portability and use with smaller devices. The design features an integrated body and connector so there are no moving parts to lose and a key-ring loop allows you to attach a strap for more secure carrying. An LED indicator on the edge is visible from any angle and illuminates during data transfers for status indication. Box Dimensions (LxWxH) 6.5 x 5.5 x 1.6"
64GB Micro Vault USM-M USB Flash Drive (White) is rated 5.0 out of 5 by 2. Rated 5 out of 5 by Gino from Very well designed/Smooth operation/High capacity Backup and carry the most important information. Encrypt and have it handy wherever you go! Rated 5 out of 5 by Nilzete from I would buy this product again and again I use transfer mobile phone data to my computer.